This page and this page explains why the 60X is almost as good as the 100X objective for our camera. It takes the lamp about 2 minutes to warm up. After a lamp has been turned off, it is a good idea to wait 30 min. before turning on again. Make sure that the switch box, camera, and microscope are all plugged into the Mac. Select the appropriate port, and hit Ok, then connect. Make sure that the camera is set to 12 bit by going to Camera -> Camera Settings -> Bit Depth = 12. Also, copy everything from iVision user folder in the administrator account into the user iVision user folder. Help, I can't find my cells! Only "Graphics converter" and "Image J" can read the IPLab images directly. For ImageJ to open those images, you need to install a macro. Go to the Plugins Menu, choose "Macro", then "Install". Install the macro named OpenMacIPLab. The description of the file IPLab Mac format is in the User's Guide (Appendix), Other programs with a configurable "import" command may be able to open them once an specific configuration is set. Nikon MicroscopyU is a useful resource for learning more about the optics relevant to the scope. 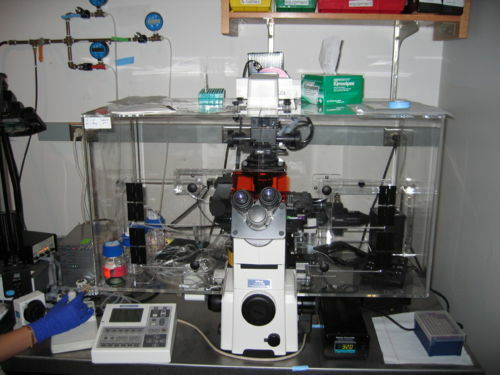 Molecular Expressions has general information related to microscopy. Some of this information appears to the the same as that offered by MicroscopyU. Image processing toolbox from Matlab. Q:Someone mistakenly put oil on the 40X dry objective. What's the best procedure for cleaning that off, without causing damage to the lens? A(from Barry Alpert):Use either ether or chloroform with a wooden handled q tip ( I know thw lab supply houses carry this item )and gently wipe the oil off the lens. DO NOT scrub , as it will damage the coating. This page was last edited on 2 April 2009, at 13:35.